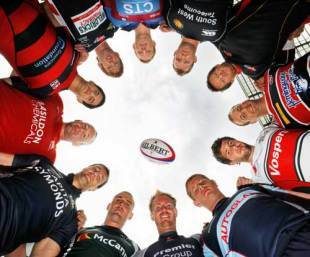 Features: Who is running rugby in England? Features: Is Johnson in denial? As the clubs at the top of the Guinness Premiership battle it out for those final play-off places and the chance of glory spare a thought for those at the top of the Championship, the new second tier of professional rugby in England. Their play-off process is already well advanced and this weekend sees Bristol play London Welsh and Exeter up against Bedford as it moves into the knockout stage. The winners of these semi-finals will then contest a two legged final to earn the right to replace Worcester in the top flight. Life may be tough at the top but it is even tougher in the second division as everybody involved at this level will confirm. There is some core funding from the RFU but nowhere near enough to sustain professional squads and with crowds in excess of 5,000 a rarity - more often they are less than 1,000 - money is a constant problem. You will have noticed it is not The [insert sponsor here] Championship - there is no title sponsor as yet. There is some television coverage of these final stages (but no direct payment) and the vast majority of club sponsors are actually benefactors who love their club and are prepared to dig deep to keep them alive. Virtually every team has had some sort of financial crisis during the season and two clubs, Birmingham and Solihull and Coventry, were forced to go into administration. But that is all forgotten by the top four for the moment. They are within touching distance of the Premiership and that is all that matters. It has been an incredible journey for my club, London Welsh. After many years of watching nothing but the very best rugby all over the world I was persuaded - 'seduced' is probably a better word - by the thought of trying to take my old team back to where they were in the 70s when five of us, the captain, John Dawes, JPR Williams, Gerald Davies, Mervyn Davies and myself, all played for the British & Irish Lions when we beat the All Blacks 2-1, with one game drawn, to win a series in New Zealand for the first, and as yet only, time. I thought I had £1.3m guaranteed for this season and next so it was an attractive proposition - a chance to make the wheel turn full circle. Sadly, it turned out to be a poisoned chalice. Our new 'owner' found himself in financial difficulties and reneged on his investment so we were left with a huge black hole. There were times in mid-winter when we genuinely did not know if we were going to be able to pay the players at the end of the month but it has been an uplifting experience to watch those guys battle through despite all the doubts they must have had about whether they could pay the mortgage. Forget the five star ride expected by the stars. They have spent the season travelling to Doncaster and Rotherham, Plymouth and Camborne but their professionalism and work ethic has been an eye opener. Reaching the initial phase of the play-offs was not that difficult. With only 12 teams it was decided that after the full league stage the top eight teams would go into the promotion play-offs. They were divided into two pools of four with each team playing the others home and away once more. The bottom four played out the same format to avoid relegation. The priority was to create enough matches to make the season sustainable and many of us thought it nonsensical that the team finishing top went into the play-offs with no advantage over the team that had finished eighth - that may change next season. The upside was that it guaranteed every club something to play for at the end of the season. Contrived it might have been but that aspect of it has certainly worked. Going into last weekend all four clubs in our pool could have qualified for the semis and a large contingent of London Welsh fans made the long trip to Doncaster to see us secure our place alongside Exeter. Yet three weeks ago we were in deep despair. Having finished the regular season in third place the minimum target was the semis but we picked up injuries to some key forwards and having lost two games on the trot to Exeter and Nottingham it looked as if our season was over. Wins in the return fixtures were now imperative and there was a cup-tie atmosphere at both as the players fought magnificently to rescue their season. Now they have the reward - a glamour semi-final at the Memorial Ground in front of a big crowd which will be televised on Sky on Friday evening. Tune in - or better still make the effort to attend (we get a share of the gate and that's pretty important) - you might be surprised by the quality, the entertainment and the passion.